Size: S (20-25cm) 7.9-9.8"; M (25-30cm) 9.8-11.8"; L (30-35cm) 11.8-13.8". The size is the length of the shortest layer. Measureed by hand,the size maybe ave a little errors. Please understand! 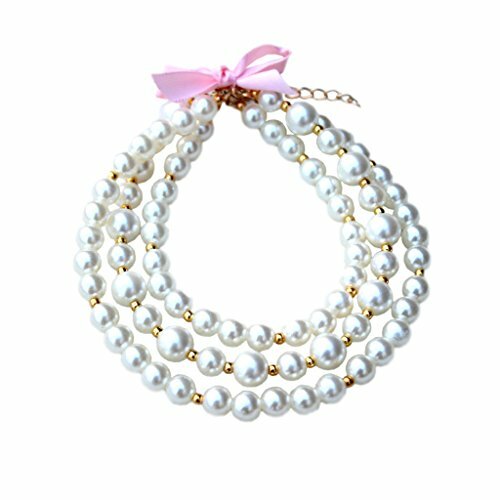 Fashion Handmade three layers ivory faux pearl small pet dog cat jewelry necklace collar with ribbon bows. Three Sizes Availible: S 7.9-9.8"; M 9.8-11.8"; L 11.8-13.8". Please measure your dog's size before ordering to ensure an accurate fit. Lovely pet necklace with gold beads and ribbon bow, perfect for weekend party costume or a perfect gift for special occasion & holiday. If you have any questions about this product by PET SHOW, contact us by completing and submitting the form below. If you are looking for a specif part number, please include it with your message.